LEARN TO PAINT FLOWERS WITH FRESH, LUMINOUS COLOR AND CONTROLLED WET-IN-WET PAINT USING SIMPLE TECHNIQUES. CREATE EXCITING COMPOSITIONS WITH DYNAMIC VALUE PATTERNS. FOLLOW EASY STEP-BY-STEP DEMONSTRATION FROM START TO FINISH, INCLUDING DISCUSSION OF MATERIALS. 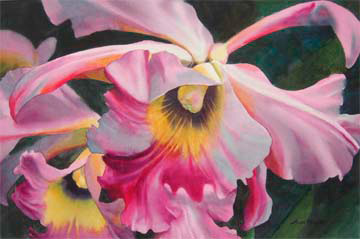 VIBRANT ORCHID… Painting In the Flow Of Watercolor demonstrates Ann’s technique for painting on traditional watercolor paper using: Waterford 140 lb. cold pressed paper by T. H. Saunders. 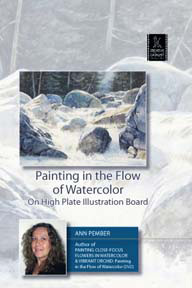 Watch Ann demonstrate her sectional, wet-into-wet technique. See how colors are mingled on the surface and blended using the right value and a variety of edges. Observe close up as she uses gravity, water and pigment to create a variety of luminous passages and textures. Her method controls and moves the watercolor to create clean, vibrant color and vividly captures the essence of the subject. Learn how Ann: looks at a subject, chooses what to keep and how she edits unnecessary elements. See how to use enough pigment to achieve deep values and beautiful, glowing darks. Whether a beginner, or a seasoned painter, you will gain many useful ideas from Ann that can help you paint more dynamic watercolors. There is extensive information included about the materials used and how Ann approaches the painting process. Approx. 110 min. SeeCreative Catalyst Productions, Inc., Ann’s producer at www.ccpvideos.comfor great videos by other talented workshop artists and tell them I sent you. “I had to write and tell you how impressed I was with your video. I am presently working through it and love your demonstrations. The step-by-step instructions are complete and easy to follow. The palette and “tip” inserts that play simultaneously with your demonstrations make it seamless and so easy to follow along. The menu is broken down into nice sized segments so that I can get to the demo I am attempting – you make it look so easy! I could go on, but you get the point. It has opened up a new dimension of painting for me. Thank you so much for your wonderful video…and relax, you are a great teacher”. Really great! Valuable instruction and demonstration of technique. Information on color palette and brushes as well. Shows touching up a painting and knowing when to stop. I loved it! Deborah R.
Wonderful, beautiful painting. This video is a great demonstration of getting the paint flowing in watercolor. My one caveat would be this is probably not the best video for a beginner. It is a wonderful demonstration, but does not focus on basic techniques that a beginner would need. If you already know the basics and want to kick your painting up a notch, this one is great. 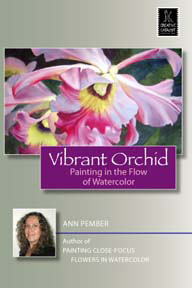 Jean S.
I have always loved Ann Pember’s watercolors and have learned a lot from her book and also from her DVD Vibrant Orchid. In the future I would like to view all of her DVDs. For all you water colorists out there I recommend this DVD. 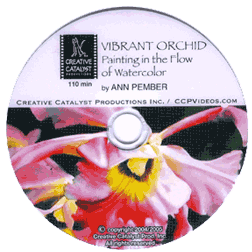 Verena H.
viewer step by step, make this DVD one for beginner or advanced painter. Limited palette, few brushes and easy techniques produce a successful watercolor within a painter’s grasp as well as take some of the apprehension out of the medium. Close-ups followed by distance shots shows us the importance of stepping back regularly to see how the shapes work in the whole picture. It is definitely an encouraging and motivating teaching video to own. I rate this DVD a 5. This DVD has tremendous instructional value. Not only do you watch a wonderful artist creating beautiful work, but the filming and production is such high quality you’ll feel like you are in the studio working with her on every step and technique. You’ll be glad you get this one! coming out with another video. makes me want more, I really feel like I have gained so much knowledge and confidence from this CD, it is so far and above any other I have had before. I just wanted to share with you how fabulous the Ann Pember video that I just completed was. I have purchased so many videos on watercolor that I believe I am an expert. I recently had my teenage daughter sell all my videos on eBay. Most of the videos I purchased were from very well known artists and you would recognize the names. Ann’s video was absolutely perfect and hers is the one I will keep. I loved the way the painting was completed and the camera stayed on every stroke so we could see the complete process. All the written material at the side was perfect along with the view of the palette. This is the most sophisticated video I have seen. I really felt at the completion that I really learned a lot. In the past I have purchased watercolor videos for the same price and they have only been 15 minutes, certainly not 110 minutes. Terrible. I think you did a great job and I hope you produce a lot more videos of Ann’s in the future.